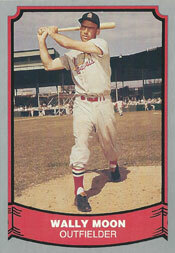 In 1954, outfielder Wally Moon became the first Cardinals rookie to reach double figures in home runs (12) and stolen bases (18) in a season. Moon’s style of play reminded many of outfielder Enos Slaughter, who in 13 seasons with the Cardinals had a .305 batting average, with 2,064 hits in 1,820 games, and an on-base percentage of .384. The Cardinals, confident in Moon’s talent, traded Slaughter to the Yankees two days before the start of the 1954 season. Moon fulfilled expectations, batting .304 with 193 hits,106 runs scored and an on-base percentage of .371 as a rookie. He earned the National League Rookie of the Year Award, outdistancing candidates such as Hank Aaron and Ernie Banks. Moon’s rookie season was highlighted by a pair of noteworthy single-game performances. In his first major-league at-bat, in the first inning of the Cardinals’ opener against the Cubs at St. Louis on April 13, 1954, Moon got a rude welcome from fans who missed Slaughter. The first two pitches to Moon from Paul Minner were balls. The next pitch was a fastball “down the heart of the plate,” Moon said. “I hit it and I hit it hard and I hit it high and I hit it long,” Moon said. “I hit it out of the ballpark, over the pavilion roof and onto Grand Avenue. I think somewhere I got a shot of adrenaline, a great surge of power. It’s probably one of the longest home runs I ever hit. Moon became the second Cardinals player to hit a home run in his first time at-bat in the big leagues. The other was Eddie Morgan in 1936. About a month later, on May 25, again against the Cubs at St. Louis, Moon had four steals, one short of the National League single-game record established by Dan McGann of the 1904 Giants. All four stolen bases came against catcher Walker Cooper, 39, the former Cardinal. “Moon gave Walker Cooper one of the most miserable days of the veteran catcher’s 15 seasons in the majors,” The Sporting News reported. Moon swiped second base in the first inning with Johnny Klippstein pitching and he stole second again in the fourth with Jim Brosnan pitching. In the fifth, after Moon singled off Brosnan, the Cubs brought in Jim Willis to pitch to Alex Grammas. Rattled, Willis threw a wild pitch and Moon scored. Angry, Willis plunked Grammas with his next delivery. A Cardinals publicist sent word to manager Eddie Stanky that Moon needed one more steal to tie the record, but Moon flied out to left in his last at-bat.